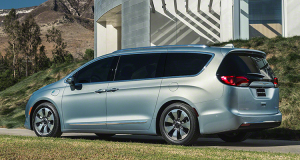 A clean-sheet redesign aims to counter the stale image of the previous-generation Chrysler minivans including a name change. Starting this spring, the successor of this ubiquitous all-American family mobile is to be known as the Chrysler Pacifica. Good-bye fuddy-duddy Town & Country, Dodge Grand Caravan, and near-forgotten Plymouth Voyager. Chrysler hopes that abandoning the Town & Country name will help recast the minivan’s image, aided by a shapely, modern body which was evidently inspired by the Italian camp at Fiat-Chrysler. Bolstered by contemporary high-tech equipment and safety features, and even a plug-in hybrid version, the reinvented minivan enters the arena with seemingly strong credentials. The Pacifica name is resurrected from a pseudo SUV/tall wagon from the mid 2000s. The engine is a 287-hp V6, mated to a nine-speed automatic—a powertrain similar to the one in the Chrysler 200 V6. The base LX starts at $28,595 and the Limited tops out at $42,595. Prices, more or less, line up with the competition from the Honda Odyssey and Toyota Sienna. The sweet spot of the range is the Touring L which lands at $34,495 with leather seating, power liftgate, and some desirable active safety features. The 2017 Chrysler Pacifica has a traditional seven-seat capacity (an eight-seat seating configuration is a $495 option), dual-sliding side doors, and the popular Stow-N-Go folding seats. Fortunately, the second row seems more comfortable than the overly low and tilted setup of the previous model. Of course, Chrysler claims the Pacifica has the largest interior volume in the segment and is capable of hauling 4×8-foot sheets of plywood. 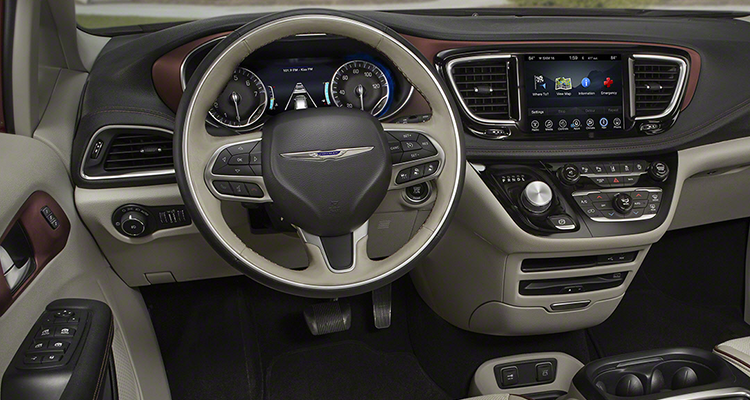 Chrysler also boasts several segment firsts, including a tri-pane sunroof, integrated second-row vacuum cleaner, and rear heated seats. Also included among the options are 360-degree camera, adaptive cruise control with autonomous braking, lane-departure monitor, and forward-collision warning. A convenience feature we’ve come to love—especially when approaching the car with arms full of groceries or carrying a baby—are hands-free sliding doors and liftgate, now available on the 2017 Chrysler Pacifica. While the Pacifica is piling on the features, there won’t be an all-wheel-drive version. Chrysler says the sales volumes seem too low to justify that—odd logic given the company went to the trouble of creating a plug-in hybrid version. But that’s more regulatory inspired than customer driven. Traditionally not known for hybrids or any other green technology, a plug-in hybrid version arrives three to six months later than the original debut, and it is expected to be priced in the mid to high $40,000s before tax incentives. It is claimed to be capable of up to 30 miles of electric range before it reverts to gas operation. 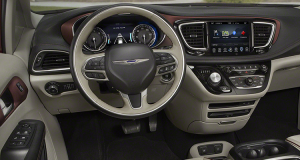 Chrysler claims ride comfort, handling agility, and noise suppression outdo the competition; we certainly will verify those assertions once we drive the Pacifica. The rear-seat entertainment system includes high-definition 10-inch headrest-mounted touch screens so passengers can watch movies, play built-in games, and connect devices with a built-in Internet connection. Despite that the minivan segment has been shrinking, while crossovers flourish, but there are still about a half-million sold annually. Chrysler held on to nearly 40 percent of those sales last year against strong competition from Honda and Toyota, yet it was clear that the company had some critical shortcomings to address. We will buy our own Pacifica soon for a full road test, so stay tuned for more.